On TQ, (at the time of writing) The Explicit Alliance own sov in a southern constellation of Delve and one system in Querious next door. Their killboards tell us that they’re very fond of losing ships, rather than necessarily killing any, especially Thrashers. The Explicit Alliance are making their tournament debut in a reasonably pleasant part of the bracket. Assuming they win, they’re not likely to hit any particularly strong teams until round three where they would potentially face Pandemic Legion, assuming PL don’t boundary violate themselves into oblivion in their first two matches. I’m not expecting anything special from The Explicit Alliance, but in terms of the AT they remain a complete unknown, so who knows? Forsaken Federation have been around for nearly four years now, but this is the first in which they have decided to test their mettle in the arena of the Alliance Tournament. They’re quite a small Alliance, just approaching 150 members at the time of writing, and from their killboards we can deduce they enjoy camping the highsec gate in Avaux, Placid. Will they be a strog AT team? No idea. They have the far more experienced R.E.V.O.L.U.T.I.O.N for their first match, and assuming they win they’ll likely be going up against one of the toughest teams you can face: The R0NIN. Something of a baptism by fire to the AT, but we’ll have to wait and see what they can make of it. First match: PPE1-R1 17:40 vs. A Band Apart. The G0dfathers are not a great AT team (although they did win NEO I -ed), and with their lack of submitting a flagship this year it seems they have no plans to change this. Currently holding three systems in Fountain, the G0dfathers are just a bit meh despite repeated attempts at the AT. In ATVIII they lost to CVA in the first round. In ATIX they drew with The Kadeshi, beat Lawn and lost to Wildly Inappropriate. In ATXI they managed to beat Urine (that’s Snuff to you and me) and lost to Ministry of Inappropriate Footwork and HUN. 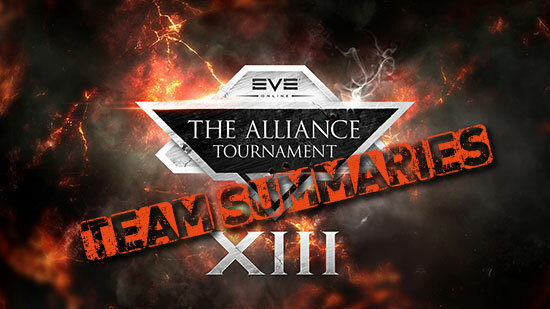 Last year in ATXII they didn’t win a single match, losing to Shadow Cartel and The Afterlife., killing only four ships in both matches combined. They’re losing to pretty reasonable teams for sure, but nothing is telling me that the G0dfathers are going to survive past the first day of the second weekend, if they manage to get that far at all. Another team making their debut to the alliance tournament, Gone Critical (unsuprisingly) are a wormholer group. A small one at that with only 128 members at the time of writing. When I tried to reach out to their members I couldn’t get anyone to talk to me, so I’m afraid that’s all I have at the moment, I’ll come back and update this if I manage to get in contact. The Gorgon Empire and their sister alliance, The Gorgon Spawn, are a primarily Russian group who currently hold a small swathe of sov in Scalding Pass. Gorgon are generally considered quite able PvPers, a great destination for Russian speakers or just Russian TZ players who like small-medium sized gangs as well as partaking in the larger blob-fests of null. They’re a group I expect to do rather well if they want to as the new sov system is rolled out. Our first batch of data on Gorgon comes from ATX, where they won only one of their five matches in the round robin against The Fourth DIstrict, losing to Evoke, Exodus, Heretic Nation and Dead Terrorists. After a break for ATXI, they returned to ATXII with a vengeance, winning their first two rounds against The Nameless Alliance and The Methodical Alliance without a single ship loss, fielding Stratios and Astarte teams respectively. In round three they ran into an infamous PL tinker setup which slowly chewed through their Orthrus/Cerb/Caracal missile kite team while paik’s Eos was once again pushed to the limits of structure. In the losers bracket they dropped straight into a match vs. Triumvirate., fresh off a victory against Agony Empire. As predicted by Baccenalian at the beginning of the match, after the closest of scrapes in keeping every ship alive for the first few minutes, the match was decided by the support war. Gorgon have solid potential to put in another good run this year, they’re a strong mid-tier team which only the toughest of opponents can deal with without breaking to much of a sweat. I’m confident in their ability to take their first match vs. Scary Wormhole people, and I would favour them against their probable second round opponents CAStabouts. The match after that however is almost certainly against Camel Empire, so they’re going to have their shot at the king. They better not miss. Though the alliance is yet to see its first birthday, the corp Hard Knocks has been knocking around since 2010 doing lots of lovely wormhole-y stuff. Amusingly their executor corp is Scared Wormhole People, as opposed to another of the alliances competing this year; Scary Wormhole People. Shortly after Hard Knocks joined Kill It With Fire, they had their first AT experience in ATXI where they lost to Ministry of Inappropriate Footwork in round one and Urine Alliance (Snuff) in round two. The word on the street (god I’m white) is that they absorbed a good part of the old Outbreak. team, really good tournament pilots. Though untested in the AT, I have a gut feeling that HK are going to beat Explicit in the first round and then just steamroll through the bracket until someone serious gives them pause. Talk about a baptism by fire. The R0NIN are an amazing AT team, one that consistently threatens to break into the top four, one that always makes the top teams clench their bottoms if and when they meet in the bracket. The alliance with quite possibly the best name in this year’s tournament have them in the first round. From their killboards, Jelly seem to be a pretty active wormholing alliance, PvPing both in J-space and through their K-space connections as any good wormhole group should. Sorry chaps, all the best against THE R0NIN but I hope you catch a break in the losers bracket. On TQ The Kadeshi are known for their intimate reltionship with DARKNESS. (known as Darkeshi) and were former members of N3. They currently hold the vast majority of Tenerifis, a little of Catch and one system in Immensea. Some may say that the Kadeshi can’t do the alliance tournament, but no-one can say they don’t. ATV: Lost first round to Star Fraction. ATVI: Records are weird but they did in fact lose a match to The Wrong Alliance. ATX: Lost to SPACE POLICE and Shadow Cartel. ATXII: Lost to The Fourth District and then Lowsechnaya Sholupen. In their first match of ATXII, The Kadeshi brought an odd Brutix team with Vexors and Enyos. Battlecruisers are even more of an odd child in the AT than they are presently on TQ. They’re super easy to apply damage to, slow as balls, only get T1 resists and are a medium weapon system platform, i.e. a HAC or even a normal cruiser tends to be better if only for maneuvering. At the beginning it looked like The Kadeshi would win, but the insane raw tank of The Fourth District’s Proteuses slowed their progress and they fell behind. In match two The Kadeshi hopped on the Gila/Sleipnir/Worm bandwagon, but it felt like it was a comp they picked up from somewhere else, not one they had spent much time practicing. Despite LS not bringing any logi, The Kadeshi struggled to land any lasting damage onto their opponents, costing them the match. Pulling Pandemic Legion in their first match made The Kadeshi’s low chances even more dismal, unless PL out-meta themselves or fly out of the arena, though The Kadeshi are no strangers to boundary violations themselves.